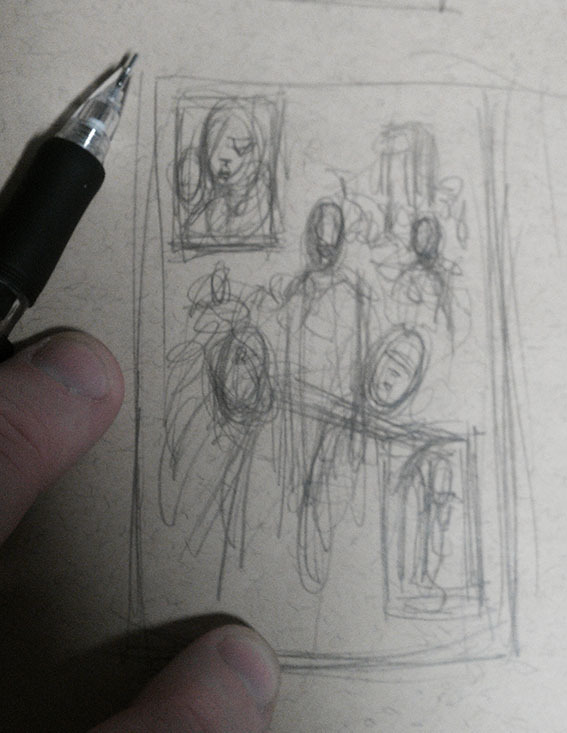 Okay so as you can see by the scale against my pencil and fingers this image is roughly 60mm x 100mm and pretty (hairily) loose… but this laid the foundations for the page as it would turn out. 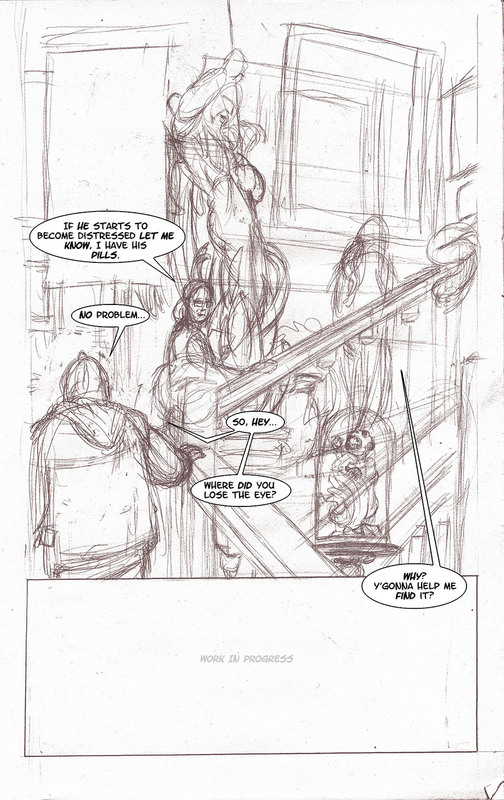 The pencils are done at over size, around A3 (in this case on a textured paper), the pencils remain hairy, as Milton Glaser might have it, I’m still searching for the right line at this stage… here I’ve over laid the speech balloons to see how they might fit… the two missing panels where drawn afterwards… at this point I was just trying to get the balance of that staircase right. 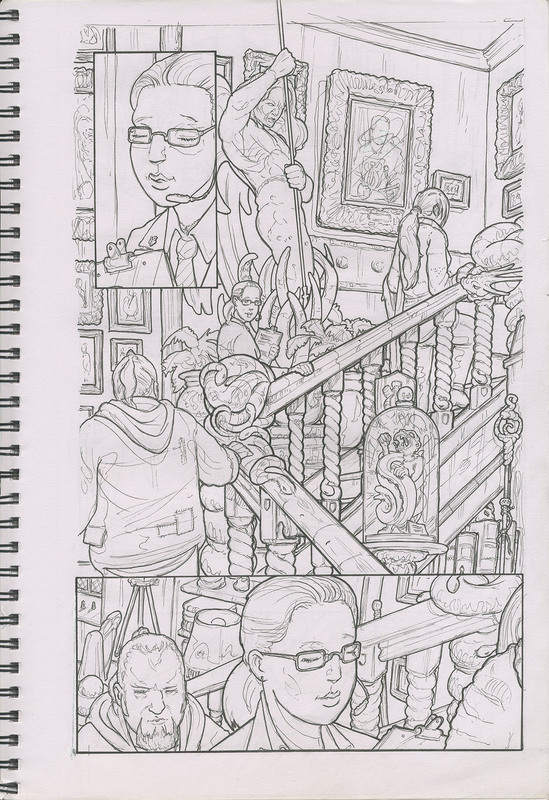 And so onto the inks… drawn directly over the pencils and then cleaned up with a well worn in eraser (I like putty rubbers for this job, they tend not to smudge as much leaving dark areas that have to be removed in Photoshop). As it turned out I wasn’t happy with the continuity between the frames here and had to do a whole lot of jiggery-pokery in PS before I was happy… compare with the image below. As you can see, I pushed the imagery around a little using the digital tools available, making Miss Stevens face the right way in that last panel, despite it not being as aesthetically pleasing (but I’m on a tight deadline here – amongst my other work). 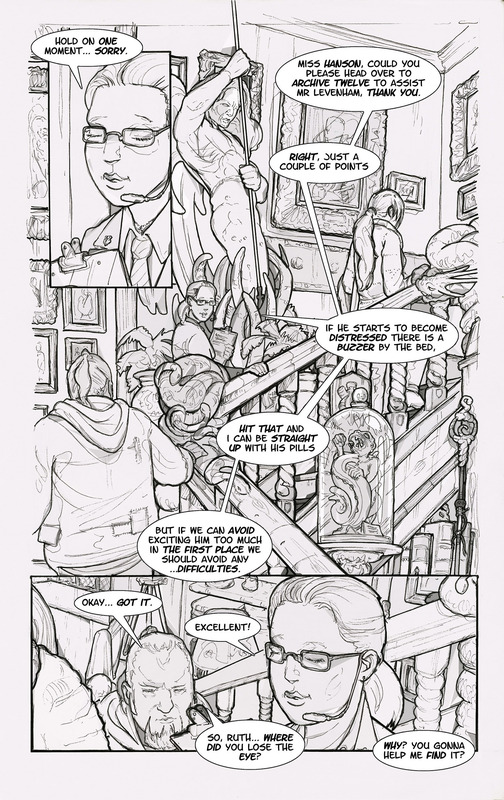 The lettering is digital, and so are the balloon ellipses… I’ve now began treating these a little different but the process is not far off here.